Do Cows Moo "Get Me The Hell Out Of Here" On Factory Farms? New research on "cow talk" shows that mothers and their offspring can communicate using different types of "moos." 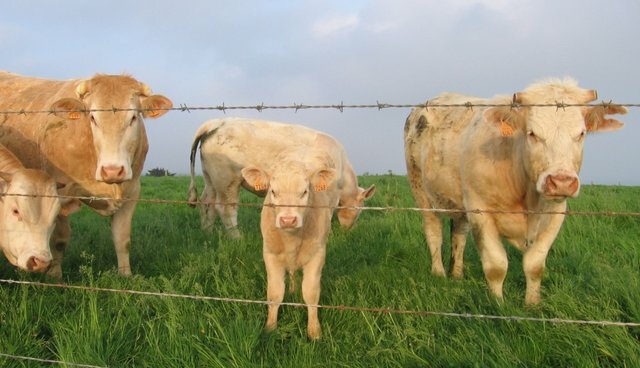 In a study published in the journal Applied Animal Behaviour Science by Mónica Padilla de la Torre and her colleagues, with the cryptic title, "Acoustic analysis of cattle (Bos taurus) mother–offspring contact calls from a source–filter theory perspective," we now know -- though farmers have known this for a long time -- that "Just as human voices differ from each other, the researchers confirmed that cows make their own unique sounds." I often wonder why scientists can't use simple and descriptive titles, because this study escaped my attention when I saw it online. Perhaps something like, "Cow mothers and calves communicate with one another using various moos" would have been more attention getting. And, the abstract for the study also is a bit cryptic, However, I do not mean this in a pejorative way, because that's what professional journals require. I also found myself reading more popular accounts of the research (please see also and where you can listen to the sounds) because I'm not an expert on how sounds are rigorously analyzed. I mention the need for more descriptive titles because this is a very significant study that has far-reaching welfare implications for how cows (and other "food animals") are treated -- read, mistreated and egregiously abused -- on factory farms, and how other animals are mistreated in a wide variety of venues. Indeed, the authors recognize this when they write: "Cattle vocalisations have been proposed as potential indicators of animal welfare." However, very few studies have investigated the acoustic structure and information encoded in these vocalisations using advanced analysis techniques. The researchers discovered three types of individually distinctive calls. "Low frequency calls (LFCs) were produced by cows when they were in close proximity to their calves, in the three or four weeks after birth. These were quiet and were made with the mouth closed or only partially open. Louder high frequency calls (HFCs) were produced by cows when they were separated from their calves (not in visual contact) and preceded nursing. Calf calls were produced when they were separated from their mothers and wanted to suckle milk." And, age, but not gender, are conveyed by the calls. "Although it has previously been suggested that cattle contact calls are individually distinctive, to our knowledge, our study is the first to use the most rigorous, modern methods to analyse their calls. This study represents an important advance in our knowledge of cattle contact vocalisations, which is essential for future work on cattle communication and welfare." Many farmers already knew much about the sort of communication that goes on beyond mothers and their young. For example, Farmer James Bourne, who has been around cows since the 1950s, said the research supports what he has always noticed himself. "A calf certainly knows its mother from other cows, and when a calf blarts the mother knows it's her calf," said Mr Bourne, who is a farmer in Lincolnshire. "If they are not distressed and they are calm they will moo fairly low to the calf, almost talking to their calf. "If they are distressed, in other words they have lost their calf or are separated from their calf, it's a much higher pitched moo. "She starts bleating louder and louder because she's distressed because he's away from her." Surely we should look more to citizen scientists to inform systematic research here and elsewhere. I've learned a lot, for example, about play behavior in dogs by spending countless hours at dog parks, and many colleagues depend on non-researchers to inform their research programs. Based on this landmark study, I'm sure I'm not alone wondering if -- or, more likely, how -- cows communicate distress when they are raised for meat. Do they moo something like, "Get me the hell out of here now." And, I always note that cows and other "food animals" not only suffer their own stress, abuse, and terror, but also that of others. What are they saying to one another? I hope this research will be used to learn just what cows and other animals are trying to tell us, as they are prepared, none too gently or humanely, for human meals. There's plenty of evidence that their journey to human forks, knives, spoons, plates, and glasses and cups is not a happy time for them nor for their family or friends, and we must pay attention to what they are telling us. Dairy farms also have a sordid history of habitual and repugnant abuse of cows (please see "New Mexico dairy shuts down after undercover activist videotape"). To quote Matt Rice, director of investigations for Mercy for Animals, "Unfortunately ... every time we go behind closed doors, our investigators emerge with images that shock and horrify most Americans." We also need to pay much more attention to how animals in other venues tell us what they're feeling and use this information on their behalf. They depend on us for protecting them from merciless and often interminable pain and suffering and slow death. A blend of common sense and solid science should help us uncover the messages that are contained in moos, oinks, baahs, bleats, squeals, quacks, and other sounds that come from the mouths and hearts of other animals.